There are two identical film projectors installed here: a popular British model called the Empire No. 12, manufactured in Lewisham by W. Butcher & Sons Ltd. 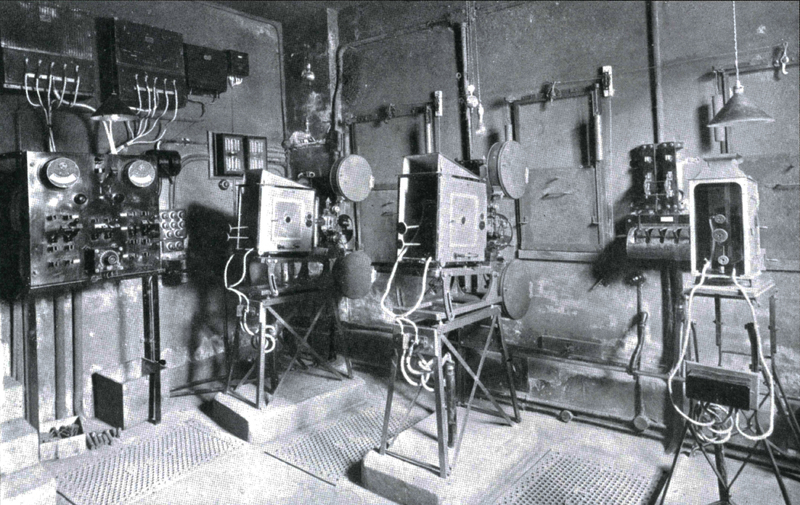 Although it was standard practice throughout most of the twentieth century to have multiple movie projectors serving a single screen, so that near-instantaneous changeovers between the separate reels of a long feature film could be effected, the equipment seen here was installed before multiple-reel feature films became common. Cinemas in 1911 typically screened a mixed programme of short films, each one reel (c. 15 minutes) or less in length. 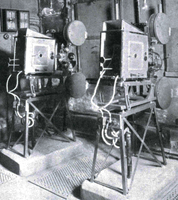 It was considered preferable to have two projectors (a) so that the next film in the programme was already laced up before the previous film ended, minimising the interval between them, (b) to avoid the danger of a single projector overheating through extended use, and (c) to be able to continue the show if one projector suffered mechanical failure. The third machine at the right is a ‘magic lantern’ slide projector, used to present announcements from the management or advertisements for local businesses on the screen; the projectionists usually created these slides themselves.